The great escape is well and truly on !!!! OK it was only Rotherham and even then we were hanging on for dear life the entire second half but we WON !!!! Who gives a damn how it was achieved, it makes up for some of our earlier games this season when we came away with nothing despite being the better side for long spells, if things even themselves out we still have a hell of a lot of things to go our way before next May. The feelgood factor around the place was fantastic, stands full, plenty of noise throughout, our German friends adding to the carnival atmosphere, you name it, while I often have issues with how it is done I have no issue with those who benefit from these Ticket promotions which clearly help to make it a better place to be. Paul Lambert promised us signings and while some are still bemoaning the quality of his additions I could not be happier than I was on Saturday, I saw enough in Collin Quaner & Will Keane to know we are going to be much more effective up front for the second half of the campaign, they will only get better with game time, Callum Elder needs time but he will offer competition for places at the Left back slot, but the one who really stood out for me was "The Ginger Pele" James Collins, what a start to life at Ipswich Town for the seasoned pro, he was a rock at the back and won so many crucial headers and blocks, his mere presence in the team seemed to rub off on Chambo too who despite what some fools are saying on the net played very well, it was win win really as it also enabled Matt Pennington to move to Right Back where he too played very well and in doing so removed our "weakest link" from the side, seeing the way Collins punched the air in delight at the end was as if he had been here years, it meant something and that is what I love to see, we can ask for no more. With the prospect of a few more signings to come I think we are giving ourselves every chance and that is all we can do, some said it was too late and not to invest a penny in the team, I disagree, and while it still may prove to be too late at least we aren't rolling over and dying, Alan Judge looks close to signing while the name of Cameron Carter-Vickers keeps popping up and if we could get those Two through the door I would be happy, I don't think we would need too much more, Emyr Huws returning will be like a new signing too, suddenly we have a massive Squad so Two or Three will probably be departing for pastures new, cya Jonas. The game itself while lacking in quality was a very exciting affair, maybe for the wrong reasons during a second half where my Heart was banging through my Chest for the entire 49 minutes, no way would we have held on even Two or Three weeks ago so to do so and get a clean sheet was big achievement and as I said at the time the defence were superb because lets be honest the Midfield struggled to impose itself and offered little support to the defence. As long as we can keep James Collins fit we will without question be stronger at the back in the remaining games. One is a bit of a fans favourite who can do no wrong, the other at times a bit of a scapegoat and a waste of money, us fans always seem as though we have to pigeon hole certain players, some are like marmite, you love them or hate them, I think in recent seasons Freddie has, at times, got away with murder, that's just my opinion, Two runs of Thirty plus games without a goal was for me poor, I think he got away with it due to this being played out of position nonsense, there is no doubt under Paul Lambert he has improved but for me is still very average in front of goal, nobody can question his work rate however as he is one of the hardest workers in the team. Then we have Kayden Jackson, a 1.7 Million pound move weighing heavily on his inexperienced shoulders, at times it has to be said he has looked lost, but a rookie in the toughest League being asked to lead the line alone in this team ??? Come on it must be the hardest job in football, the supply has at times been non existent and with nothing to feed off Strikers will struggle. I've picked these Two out as they are the two leading scorers at the club which doesn't say much, but who do you prefer ? If it is goals we are after Freddie has Six to Kayden's Four and playing slightly deeper Freddie looks to be the better option, however is there much to choose between them when it comes to hitting the net ? I came up with One amazing statistic, Freddie has had 1,703 minutes of playing time this campaign for his Six goals meaning he scores every 284 Minutes, Kayden on the other hand has had 1,136 Minutes of playing time for his Four goals meaning he scores every, oh wait every 284 Minutes !!! Incredible and nothing to choose between the Two, of course there is only One of these Two that will be on a lot of fans team sheets and we know who that is LOL. I love stats. 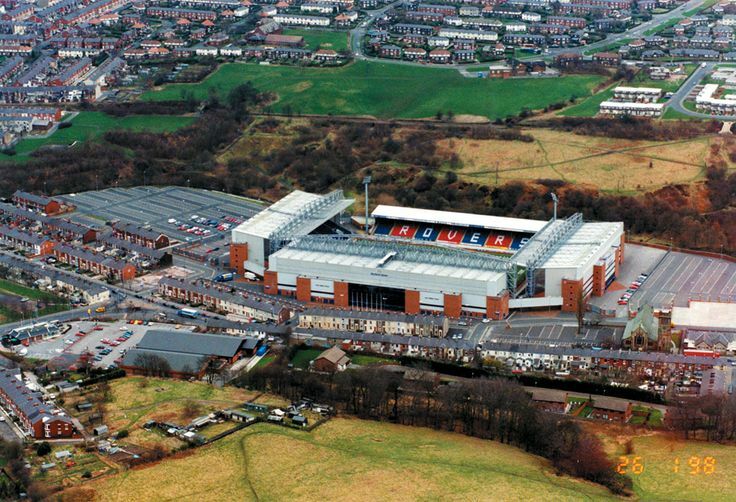 The club was founded in 1875 and on On 28 September 1878, Blackburn Rovers became one of 23 clubs to form the Lancashire Football Association. Blackburn was an early F.A. Cup winner when on 29 March 1884 with a 2–1 victory over the Scottish team Queen's Park and then repeated the feat over the next two seasons for 3 consecutive Cup wins. They won the trophy for a fourth & fifth time in 1890 & 1891 respectively. Blackburn Rovers struggled during the early years of the 20th century, but the results began a gradual improvement. During the first three decades of the 20th century, Blackburn Rovers were still considered a top side in the English league. They were First Division champions in 1911–12 and 1913–14, and F.A Cup winners in 1927–28..
Blackburn Rovers maintained a respectable mid-table position in the First Division until they were finally relegated from the top flight (for the first time since the foundation of the league) in the 1935–36 season. When the league resumed after the war, Blackburn Rovers were relegated in their second season (1947–48). The club remained in the second division for the following ten years. After promotion in 1958, they again returned to the mid-table position they had occupied in the earlier part of the century. They were again relegated from the First Division in 1966 and began a 26-year exile from the top division. During the 1970s, Blackburn Rovers bounced between the Second and Third Divisions, winning the Third Division title in 1975, but never mounted a challenge for promotion to the First Division despite the efforts of successive managers to put the club back on track. Following the Jack Walker takeover Rovers finished 19th in the Second Division at the end of the 1990–91 season, and the new owner had made millions of pounds available to spend on new players and appointed Kenny Dalglish as manager in October 1991. Blackburn secured promotion to the new FA Premier League at the end of 1991–92 season as play-off winners, ending 26 years outside the top flight. Rovers made headlines in the summer of 1992 by paying an English record fee of £3.5million for the 22-year-old Southampton and England centre forward Alan Shearer. After finishing fourth in 1992–93 and runners-up in 1993–94, they went on to win the Premier League title in 1994–95. Kenny Dalglish moved upstairs to the position of Director of Football at the end of the Premier League winning season, and handed over the reins to his assistant Ray Harford. Blackburn Rovers made a poor start to the 1995–96 season, and found themselves in the bottom half for most of the first half of the season. A terrible start to the 1996–97 Premier League campaign saw Harford resign in late October with the club bottom of the division. Relegation looked a real possibility, just two seasons after winning the league. 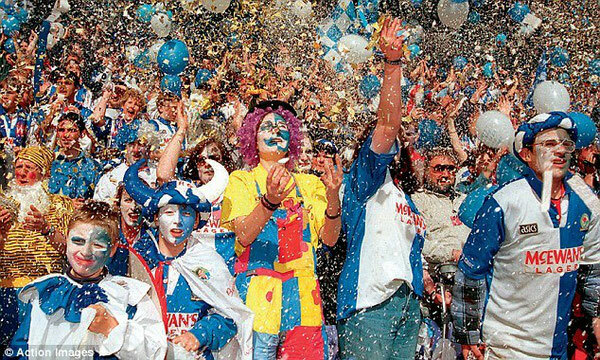 At the end of the 1998/99 season Blackburn were relegated back to Division One. Jack Walker died just after the start of the 2000–01 season, and the club dedicated its promotion challenge in memory of their benefactor. Fittingly, they returned to the Premier League after a much improved season, finishing second behind Fulham. In 2001–02, Blackburn won their first-ever League Cup by beating Tottenham Hotspur 2–1 at the Millennium Stadium in Cardiff. In November 2010 the Indian company V H Group bought Blackburn Rovers under the name of Venky's London Limited for £23 million. The new owners sacked manager Sam Allardyce and replaced him with first-team coach Steve Kean, initially on a temporary basis. In December 2011 it was announced that Blackburn Rovers posted an annual pre-tax loss of £18.6m for the year ending 30 June 2011. Despite this the owners of Blackburn Rovers provided assurances over the continued funding of the club, even if they were relegated. On 7 May 2012, the club was relegated to the Championship after being defeated at home by Wigan Athletic at home in the penultimate game of the season, ending 11 years of being in the English Premier League. 10 point gap reduced to 3 in 2 weeks?? Message to Tangfastic if you are lurking, buddy....., get back posting and offering your superb humour to The Don Cup, (along with your valuable football chat) ...., 45 points is still very much in it. Caption: Mowbary looks disgusted after a Canary shits on his shoulder. Caption: Mowbary looks very worried when he sees ME approaching him. Last edited by derick_ipsw on Wed Jan 16, 2019 7:03 am, edited 1 time in total. Caption - did I fart, or is that the Ipswich team arriving? Another top notch preview......, and......, with the way matches are officiated these days, it's worth a punt that Sears or Jackson could score in the 284th minute! Seriously though, there is a crazy bet in amongst that lot,......., I know it's only stats, BUT, calculate the last time he scored, subract that time from 284, and you'll come to the minute that he should score next. Considering the last time he scored was v Wigan, then he should score Friday night around 11pm. That could well be true, but we don't want to know, Fred. Fearing a loss here. They've got certain players that are bankers (yes, bankers) for first scorer bets. Won't mention names but the pickle in goal better have another career day. Hopefully 0-0 or 1-1........, but if gambling, which I never do on ITFC, it'd be 2-0 Rovers. Photographer: "Come on, Tony, give us a better smile than that!" Tony: "Can't. Forgot to put my teeth in this morning." If we win this, it could certainly be a turning point. The question is, has there been enough time for the new arrivals to gel? Obviously there hasn't been enough time for them to gel, so we'll be lucky to get a draw. Caption: After seeing the sun shine between the clouds, Mowbray realizes he'd better get back in the coffin. Caption " Boy, that cannabis sure makes you feel relaxed"
Am hoping their FA Cup exploits exhausts or injures (for 1 game ) as many as possible so that we can sneak at least a draw but hopefully 1-3 to Town. Here's hoping! Caption. Well I can smile a little it is my old team that won and I want them to stay up. For me it's quite simple...Jackson every time. He's the future and I'm sure will get better; Sears is very much the past and I suspect we've seen the best he can do.He certainly is not (and never has been) an out and out striker and his finishing in the box is not good enough. He does work very hard for the team (runs around a lot!) which is why I think so many fans think he is "the bees' knees". Jackson has real pace and although he has flaws he does have some good goals in him (his recent goal v Millwall). At the moment I'd use him as an impact sub. Incidentally,I think Ellis Harrison IS a natural goalscorer and we haven't seen the best of him yet,mainly because he was out injured for some time. I'd happily lose Sears but would like to hold on to both Jackson and Harrison. Yea, where is Tangfastic of late, I've not seen a post of his on here for a month or more although i’m pretty certain he was logged in on the website a couple of hours ago. Come on boys, who’s pissed him off ? or is he another who easily gets the hump and disappears for a while. Strange really as most of his posts were pretty balanced and inoffensive and unlikely to tease a reaction from anyone sufficiently likely to p*ss him off, even stranger that he’s logging on and not posting. Come on Tang, what’s the problem mate ? I don’t know anything about that but if true surely you’d simply change your log on details or create a new account but as far as I can see he’s still logging on using his tangfastic account but not posting, how bizarre is that. Anyway, back on subject I find it strange that Blackburn Rovers have a manager who played for Town for 5 years, was our Club Captain, scored in our Championship Play Off Final that took us to the Premier League, was 1st Team Coach and even Acting Manager and there’s no mention of this in the match preview, or have I read it too quickly and missed it ? As far as the match is concerned I think we’re very unlucky to be meeting Blackburn after two successive confidence boosting wins, having lost their previous three and only picked up 2 points in their last five 5 games played in December. Dont know Charny, I was more concentrating on the here and now with my part, to be honest I'm not overly interested in Mowbray or what he did a few years ago, I will probably be rueing what he does Saturday now lol. Can't see anymore than a 1-1 draw at best if I'm being totally honest. Big ask to get the new signings to gel so soon. Caption "hmm.. is that bluemike in the crowd I'll have that loser after the game for not mentioning me in his preview the git"
They had an FA Cup game this evening, had to find out what the eventual score was to ascertain better judgment of what to expect this weekend. Voted for a point each. They'll be disappointed that their season is now effectively over and may have something to prove. We ourselves are picking up scores here and there but nothing too fancy. Got a good record there in recent years such as the last day escape in 1994 and FA Cup victory two years later so maybe (this time) we can take something again from the journey. Has the feel of a 1-1 draw. I'd take that right now. It's always a great preview and well received by all who are grateful for the effort that people put in. You”ll struggle to find the score of their cup game if you’re looking at Wednesday Nights fixtures SJ as they played Tuesday Night and lost at home to Newcastle United 2-4 (AET). I guess we’re all wired differently Mike, I just like following the fortunes of ex-players especially when they stay in the game after they leave, and especially those that gave a lot to our club when they were here. I really liked Tony Mowbray and look forward to seeing how we do against his team. It would be nice to take three points off him, but I don’t really see it happening unless our new boys get to gel very quickly. If our defence holds tight at best I see a 1-1 draw and would happily take it. Andy, I like Tony Mowbray but oddly never got excited about him being our manager, prior to the Blackburn post I thought he had been poor. As for a 1-1 draw, I would be over the moon tbh. A draw would be a decent result however, if the club are to stay up these types of games must be won. "Mowbray experienced a sudden sense of uneasiness as he saw Prince Phillip driving down the touchline on his mobility scooter"
I read this last night and thought, “wtf is this about?” .... but headed to bed. Just heard the news this morning, and , nice one. Very on topic caption! Press conference reporter: Tony, what is your overall view on referees? Just heard the news this morning, and :lol: , nice one. Very on topic caption! Actually the expression on Tonys face is like he is looking at someone and thinking “kiss arse”! Hey Tony, did you know that Prince Philip still drives?